Horseradish peroxidase conjugated Goat anti Chicken IgA antibody (AAI28P) used for the measurement of IgA levels by ELISA. Antibody levels in APEC- and mock-infected birds following primary infection and after homologous re-challenge. 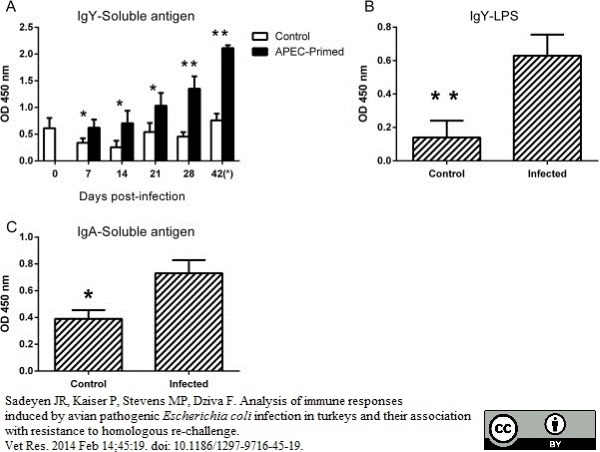 The levels were measured by ELISA using different antigens; IgY levels against soluble χ7122nalR antigens (A), IgY levels against O78 LPS purified from χ7122nalR (B) and IgA levels measured against soluble χ7122nalR antigens (C). At 0, 7, 14, 21, and 28 days post-primary infection, five birds per group were sampled and ten birds per group were sampled after re-challenge (day 42). The data in panels B and C reflect levels at post-mortem examination on day 42, one day after re-challenge. * = P ≤ 0.05; ** = P ≤ 0.01. From: Sadeyen JR, Kaiser P, Stevens MP, Dziva F.
Antigen-specific serum IgM (A), IgA (B), and IgG (C) against S. Virchow and S. Typhimurium at 5, 11, and 26 DPI, following infection of 7-day old chickens. Data shown are based on five birds per group at each time point. Error bars represent the standard error of the mean. An asterisk indicates that there was a significant difference between the S. Virchow infected group and uninfected group (*) or the S. Typhimurium infected group and the uninfected group (**) (P < 0.05). Salmonella Virchow infection of the chicken elicits cellular and humoral systemic and mucosal responses, but limited protection to homologous or heterologous re-challenge. Horseradish peroxidase conjugated Goat anti Chicken IgA antibody used for the evaluation of flagellin specific IgA response in exposed chickens by ELISA. NHC flagellin-specific antibody levels in the groups immunized with (A) 40 μg of NHC protein and (B) 20 μg of NHC protein, both compared to levels in the solvent injected control group. Antigen-specific IgY, IgM or IgA antibody levels were determined in 20-fold diluted sera collected from 12 day-old individual animals. Results are displayed as a box-and-whisker plot (S/R, sample to reference ratio). An asterisk indicates statistically significant differences (α<0.05) between compared groups. Chicken Immune Response after In Ovo Immunization with Chimeric TLR5 Activating Flagellin of Campylobacter jejuni. Horseradish peroxidase conjugated Goat anti Chicken IgM antibody used for the evaluation of flagellin specific IgM response in exposed chickens by ELISA. Kinetics of NHC-specific antibody levels following in ovo vaccination. ELISA results demonstrating the NHC flagellin-specific reactivity of serially diluted sera collected from (A, C, E) 12 day-old and (B, D, F) 18 day-old chickens injected with 40 μg of NHC flagellin or solvent (control). Serum IgY (A, B), IgM (C, D) and IgA (E, F) antibody responses are indicated. Graphs represent the analysis of individual animals, displayed as a box-and-whisker plot. The amount of antigen-specific antibodies was expressed in a relation to the reference sera (S/R, sample to reference ratio). An asterisk indicates statistically significant differences (α<0.05) between groups. Cecal colonization of C. jejuni and sIgA responses in vaccinated and control chickens. (A) Chickens were challenged with C. jejuni at 18 day of age. One week post-inoculation (25 days of age) the number C. jejuni in the ceca was determined by plate counting (CFU/ g). Each symbol represents one chicken of the indicated groups, bars represent the mean number of log10 CFU/ g per group. (B) Antigen-specific sIgA in 20-times diluted cecal content from 25 day-old chickens (one week after C. jejuni challenge) as determined by ELISA. Graphs represent the analysis of individual animals of each of the indicated groups, displayed as a box-and-whisker plot. Goat anti Chicken IgA:Alk. Phos. Goat anti Chicken IgA antibody recognizes chicken immunoglobulin A and shows no cross-reactivity with other chicken immunoglobulin classes in immunoelectrophoresis. Goat anti Chicken IgA antibody may react with IgA from other species. Antisera to chicken IgA were raised by repeated immunisation of goat with highly purified antigen. Purified IgG prepared by affinity chromatography. Withanage, G.S. et al. (2005) Cytokine and chemokine responses associated with clearance of a primary Salmonella enterica serovar Typhimurium infection in the chicken and in protective immunity to rechallenge. Infect Immun. 73 (8): 5173-82. Singh, R. (2010) Immunogenicity and protective efficacy of virosome based vaccines against Newcastle disease. Wyszyśska A et al. (2004) Oral immunization of chickens with avirulent Salmonella vaccine strain carrying C. jejuni 72Dz/92 cjaA gene elicits specific humoral immune response associated with protection against challenge with wild-type Campylobacter. Beal, R.K. et al. (2005) A strong antigen-specific T-cell response is associated with age and genetically dependent resistance to avian enteric salmonellosis. Buckley, A.M. et al. (2010) Evaluation of live-attenuated Salmonella vaccines expressing Campylobacter antigens for control of C. jejuni in poultry. World Journal of Vaccines. 05 (04): 155-164. Beal, R.K. et al. (2004) Age at primary infection with Salmonella enterica serovar Typhimurium in the chicken influences persistence of infection and subsequent immunity to re-challenge. Vet Immunol Immunopathol. 100 (3-4): 151-64. Park, S.I. et al. (2010) Immune response induced by ppGpp-defective Salmonella enterica serovar Gallinarum in chickens. J Microbiol. 48 (5): 674-81. Beal RK et al. (2004) Temporal dynamics of the cellular, humoral and cytokine responses in chickens during primary and secondary infection with Salmonella enterica serovar Typhimurium. Avian Pathol. 33 (1): 25-33. Zhang L et al. (2008) Enhancement of mucosal immune responses by intranasal co-delivery of Newcastle disease vaccine plus CpG oligonucleotide in SPF chickens in vivo. Res Vet Sci. 85 (3): 495-502. Park, E.H. et al. (2014) Protective efficacy of a single dose of baculovirus hemagglutinin-based vaccine in chickens and ducks against homologous and heterologous H5N1 virus infections. Viral Immunol. 27 (9): 449-62. Barrow, P.A. et al. (2004) Faecal shedding and intestinal colonization of Salmonella enterica in in-bred chickens: the effect of host-genetic background. Epidemiol Infect. 132 (1): 117-26. Andersen, J.P. et al. (2013) No protection in chickens immunized by the oral or intra-muscular immunization route with Ascaridia galli soluble antigen. Avian Pathol. 42 (3): 276-82. Koppad, S. et al. (2011) Calcium phosphate coupled Newcastle disease vaccine elicits humoral and cell mediated immune responses in chickens. Res Vet Sci. 91 (3): 384-90. Rezar, V. et al. (2007) Dose-dependent effects of T-2 toxin on performance, lipid peroxidation, and genotoxicity in broiler chickens. Poult Sci. 86 (6): 1155-60. Sadeyen JR et al. (2014) Analysis of immune responses induced by avian pathogenic Escherichia coli infection in turkeys and their association with resistance to homologous re-challenge. Veterinary World. 7 (9): 749-753. Frontiers in Veterinary Science. 1: 6. Radomska, K.A. et al. (2016) Chicken Immune Response after In Ovo Immunization with Chimeric TLR5 Activating Flagellin of Campylobacter jejuni. PLoS One. 11 (10): e0164837.